The traditional goal of wound care is to heal or prepare for surgical closure, but techniques and procedures used to heal a wound can be painful or uncomfortable and very costly. It is inappropriate to ignore wounds or declare them untreatable in patients at the end of life. Palliative wound care requires a different mindset than traditional wound care, yet is based on the same fundamental scientific principles. The concept of palliation for chronic wounds is a relatively new concept within the past ten years. Palliation recognizes and accepts non-healing endpoints as appropriate care and uses non-healing strategies to comfort patients and improve quality of life. 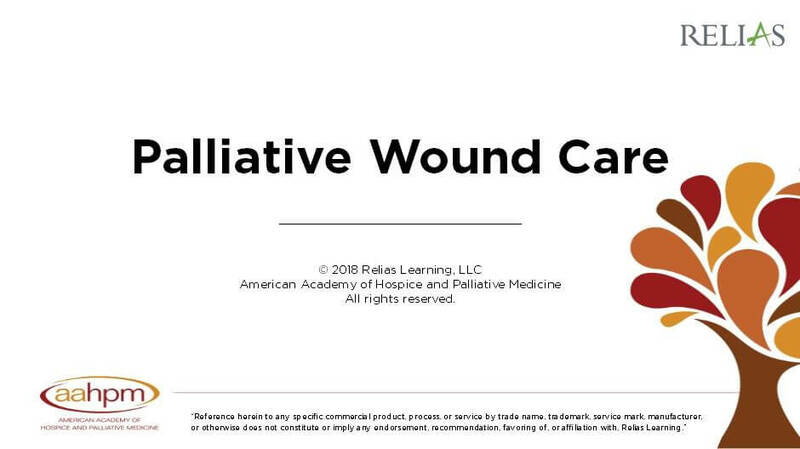 This presentation provides a framework for understanding and providing palliative care for wounds at the end of life. Recognize and describe the kinds of wounds that are highly prevalent at the end of life. Identify and describe the co-morbidities/risk factors related to wounds at the end of life. Recognize and describe goals and plans for wound care that are consistent with palliative care. Recognize and describe how to manage symptoms of pain and odor. How Prevalent are Wounds at the End of Life? How do We Approach Wounds at the End of Life? Part I. What is Palliative Wound Care? Can Wounds be Treated at End of Life? Dr. Aletha Tippett received her BS in chemical engineering from the University of Missouri in 1975 and her MD from the University of Cincinnati in 1997. Dr. Tippett has done wound care for 20 years and has treated over 15,000 wounds. Her main areas of focus in wound care are limb salvage and pressure ulcer prevention and treatment and she brings a bio-engineering approach to these. She has been honored with numerous awards in the healthcare community and is a published author and international speaker and teacher on wound care topics. She is president of the Hope of Healing Foundation, dedicated to limb salvage and novel wound therapies. She is a member of the International Biotherapy Society and is an active "biotherapist", using maggots and leeches in her wound care practice. Dr. Tippett is also active in hospice and is a certified hospice medical director for Brookdale Hospice in Dayton, Ohio. Disclosure: Aletha W. Tippett, BSChE, MD, ABFP, ABHPM, AAPM, WCC, CWS has declared that no conflict of interest, Relevant Financial Relationship or Relevant Non-Financial Relationship exists. The target audience for this course is: Nurses; Physician Assistants; Physicians; in the following settings: Hospice, Palliative Care.